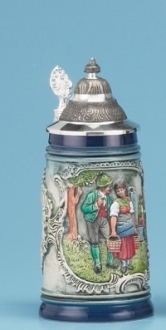 This beautiful stoneware beer stein was handcrafted in Germany by Zoeller & Born. The decal features an eagle, with the text Deutschland Germany surrounded by the names and crests of the 16 German states. On one side is a handpainted relief of a castle and on the other side is an alpine village chalet . This .5 liter stein is about 9.5 inches tall.